Eida, M.F., Nagaoka, T., Wasaki, J., Kouno, K. 2013. Phytate degradation by fungi and bacteria that inhabit sawdust and coffee residue composts. Microbes and Environments, 28(1), 71-80. Dissanayaka, D.M.S.B., Maruyama, H., Masuda, G., Wasaki, J. 2015. Interspecific facilitation of P acquisition in the intercropping of maize with white lupin in two contrasting soils as influenced by different rates and forms of P supply. Plant and Soil, 390(1), 223-236. Wasaki, J., Taguchi, H., Senoura, T., Akasaka, H., Watanabe, J., Kawaguchi, K., Komata, Y., Hanashiro, K., Ito, S. 2015. Identification and distribution of cellobiose 2-epimerase genes by a PCR-based metagenomic approach. Applied Microbiology and Biotechnology, 99(10)4287-4295. Dissanayaka, D.M.S.B., Maruyama, H., Nishida, S., Tawaraya, K., Wasaki, J. 2017. 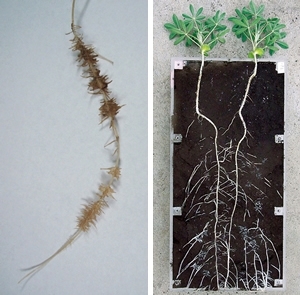 Landrace of Japonica rice, Akamai exhibits enhanced root growth and efficient leaf phosphorus remobilization in response to limited phosphorus availability. Plant and Soil, 414(1-2), 327-338.